Born in Holland in 1933, Bill died in Kelowna, BC on January 17, 2019. Immigrating to Canada in 1953, he built his professional life in the automotive business in Vancouver, Lillooet and Kamloops, BC. He is lovingly remembered by his wife of 58 years, Tina, three daughters; Shirley, June and Debbie and their families, many friends and a large, extended family in the Netherlands. 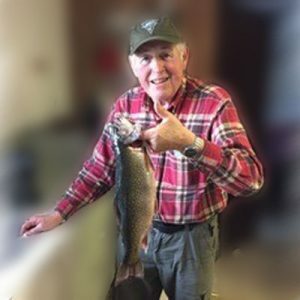 An avid outdoorsman, it was never too early or too cold to go ice fishing and many a friend enjoyed his smoked salmon and canned trout. The family is grateful for the compassionate care provided by the staff at Cottonwoods. Honoring his wishes, there will not be a funeral. So sorry to read of Bill’s passing. We miss you on the ‘block’. Hugs to Tina and family, from the Fennell family. My deepest dondolences for your great loss. Thought are with you Tina, Shirley, June, Debbie and family. May the great memories of Bill be the strength for all of you in the days ahead. I will never forget the many great chats we had sitting by your kitchen window in Kamloops. My Deepest condolences for your Loss. Bill was very kind man and always had time to chat with me as a child and an adult. I will miss him and his great smile. Although I knew that Bill was not in the best of health, it was still a shock to learn of his passing, in a recent issue of the Kamloops This Week newspaper. While ice fishing, I had many interactions with Bill and sometimes with you, too Tina, at Heffley and Red lakes and always enjoyed the experience and the company.. And, I met Debbie once — at the Kamloops Fish & Game Club’s public fish-out in January, at Walloper Lake several years ago. As it said .in the obituary, Bill was well known for his canned trout (mostly brookies from Red Lake, I believe). He and Al Reid were legendary at Red. Tina, My heart-felt condolences to you and the girls. May his fishing lines always be tight in the great hereafter. Dad to Sassy and Misty, the 2 Brittany Spaniels we played fetch with while ice-fishing over the years.